Pg Dr Siti Rozaidah’s current research interests are leadership, national culture and public sector management. Other areas of interest are in human resource development policies and employability. 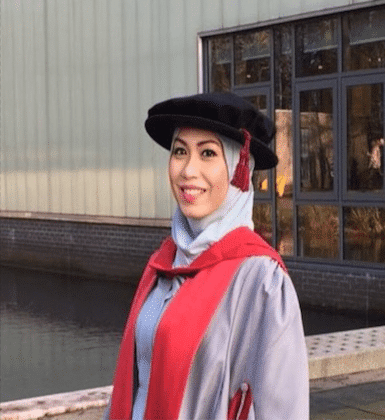 She graduated with her PhD in Management Learning and Leadership from the Lancaster University Management School (LUMS), United Kingdom in 2016, her Masters in Human Resource Development & Consulting from LUMS in 2007 and her Bachelor’s Degree in Accounting and Financial Management from University of Sheffield in 2006. She joined the UBD School of Business and Economics as Lecturer in 2008. She welcomes research collaboration in the areas of leadership and cross-cultural management. 2016 LANCASTER UNIVERSITY MANAGEMENT SCHOOL, U.K.
PhD in Management Learning & Leadership. 2006-2007	LANCASTER UNIVERSITY MANAGEMENT SCHOOL, U.K.
2004-2006	UNIVERSITY OF SHEFFIELD, U.K. Leadership. Culture. Public Sector Reforms. Employability. Career development. Lifelong learning. Continuous Professional Development. Talent Development. Organisational Development and Change. Human Resource Development. Organisational Behaviour. Lim, S., Idris, R., Zain, A. Y., & Othman, R. (2010). Personality traits and implicit leadership theories of Bruneians. International Journal of Strategic Management, 10(1). Md Zain, Ali Yusob & Othman, Rozhan & Lim, Syamimi & Pg Idris, DR. (2014). Brunei implicit leadership theories: Impacts of expectation gap. Review of Strategic and International Studies. 6. 12-21. Md Zain, Ali Yusob & Othman, Rozhan & Lim, Syamimi & Siti Rozaidah, Dayangku. (2015). Attributes of effective leadership from the perspectives of implicit leadership theory (ILT): A study in Brunei. International Journal of Science Commerce and Humanities. 3. 58-64. Title: " Implicit leadership theories of Bruneians: Insights from the Brunei public sector"
Phuket International Conference (PSU PIC 2018) on ‘Creativity and Innovations for Global Development’ in March 11-12, 2018 at Prince of Songkla University, Phuket Campus, Thailand. Title: "Addressing Push and Pull Factors of Youth Engagement in Agriculture: Exploring the Role of Human Resource Development in Brunei"
The 6th Conference on Anthropology and Sustainability in Asia/ The 5th Symposium on Language and Sustainability in Asia/The 4th Conference on the Social Sciences, Sociology and Globalization in Asian Issues for Globalization and Sustainability II held June 24-25, 2018 at the Mitsui Garden Hotel in Hiroshima, Japan. Title: "Creating a leadership development project: A faculty-wide initiative at UBDSBE"
The 10th Developing Leadership Capacity Conference (DLCC) on "Innovation and Creativity in Leadership Learning, Development and Education" held July 12-13 2018 at the Bristol Business School, United Kingdom. Title: "HRD STRATEGIES IN ASEAN AND ITS PIVOTAL ROLE ON ATTRACTING BRUNEIAN YOUTH IN AGRICULTURE"
The 23rd Asia-Pacific Decision Science Institute International Conference on “Corporate Entrepreneurship & Innovation” held 16-20 July 2018, Mercure Hotel Makkasan, Bangkok, Thailand. Title: "The Influence of National Culture On The Enactment Of Leadership In Public Sector Organisations: A Case Research In Brunei"
The 32nd British Academy of Management Annual Conference "Driving Productivity in Uncertain and Challenging Times" held 4-6 September 2018, Bristol Business School, University of the West of England. HRD Consultant for Animalcare Lancaster, United Kingdom. Consulted on improving the organisation’s volunteer programme.